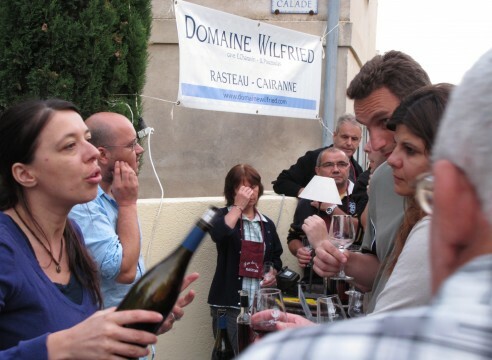 As you approach Rasteau, or any of the other wine villages in the northern part of the Vaucluse, the vines cuddle up to the edges of the town as if not even the smallest parcel of land can be left unplanted. 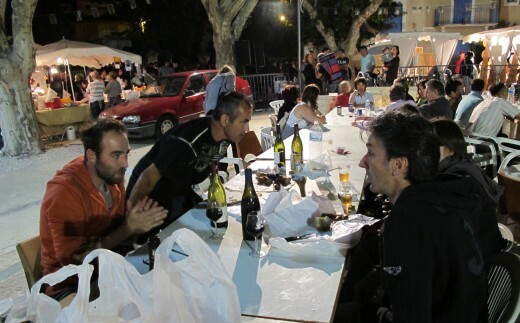 Rasteau, situated north of Gigondas, was teeming with merriment and the kissing of wine glasses Saturday evening as thousands poured into its winding hilly streets for a wine festival. 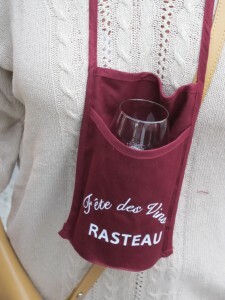 For four euros you got a Rasteau-logo glass, a glass pouch to hang around your neck and a permission slip to drink an infinite number of tastings of Rasteau-produced wines. Three bands enlivened the atmosphere, one playing the obligatory awful renditions of 70’s disco hits. And then there was Polge Gaetan, a music teacher donning a burnt-orange hoodie (UT color), who is related to Vincent Havard, a “Francais” who is the ‘wine guy’ and manager of the Mercy Wine Bar in Dallas, Texas. The “Mercy” — the name is not a homophone of “Merci”; it is swiped from “Oh, Pretty Woman” by Roy Orbison who chirps”… no one can look as good as you…….Mercy,” has an award-winning wine menu of astonishing depth with one exception: no Rasteau. Perhaps Polge can put a word (“pistonner”) for the local red into Vincent. Rasteau, an Appellation d’Origine Contrôlée Côtes du Rhône-Villages in the southern Rhône wine region of France, has produced AOC fortified wines since 1944 and the red wine vintages were added to the AOC as of 2009. 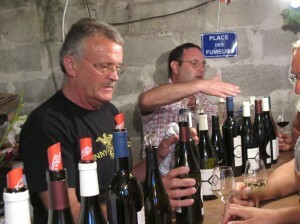 This entry was posted in Wine and tagged Mercy Bar, Rasteau, Wine. Bookmark the permalink.